Falling Waters with Stunning Waterfall Views! 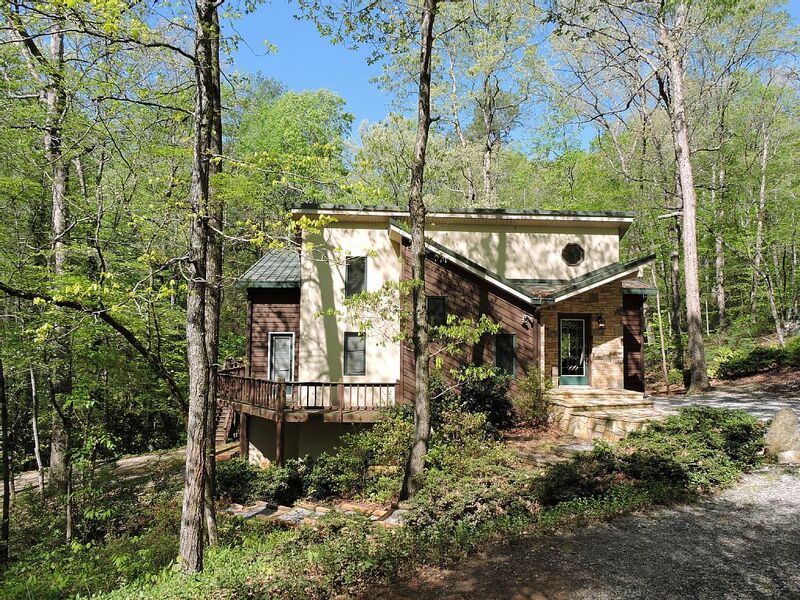 This very unique home is on 6 acres of pure beauty. 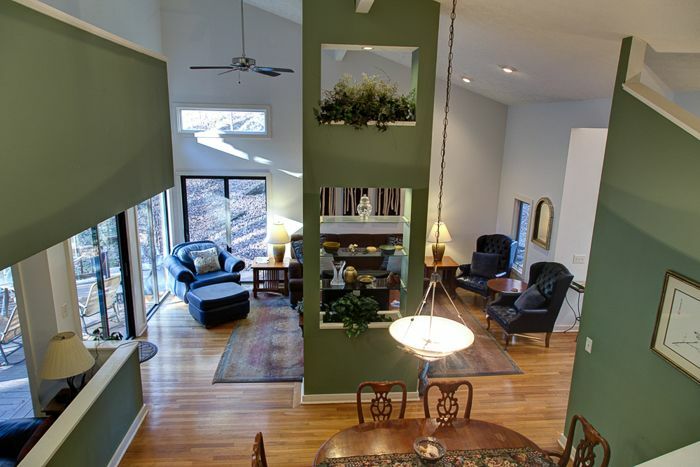 It provides spectacular views throughout the entire home that is overlooking the river and 150' waterfall. 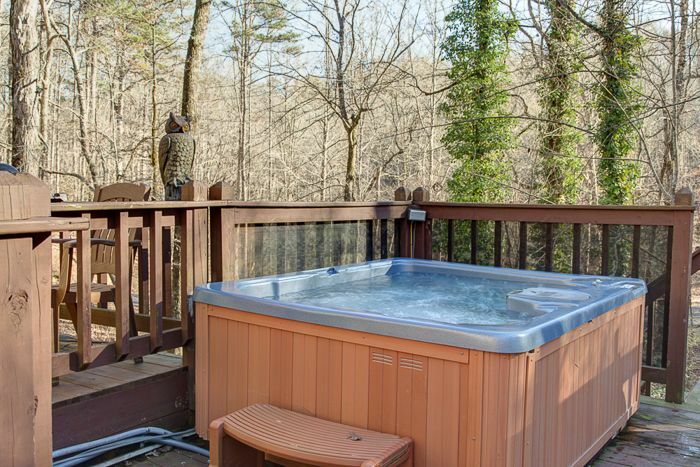 These beautiful views can be seen from the living room, den, kitchen, master bedroom, master bath jacuzzi, hot tub and lower screened porch that has rockers for your enjoyment. 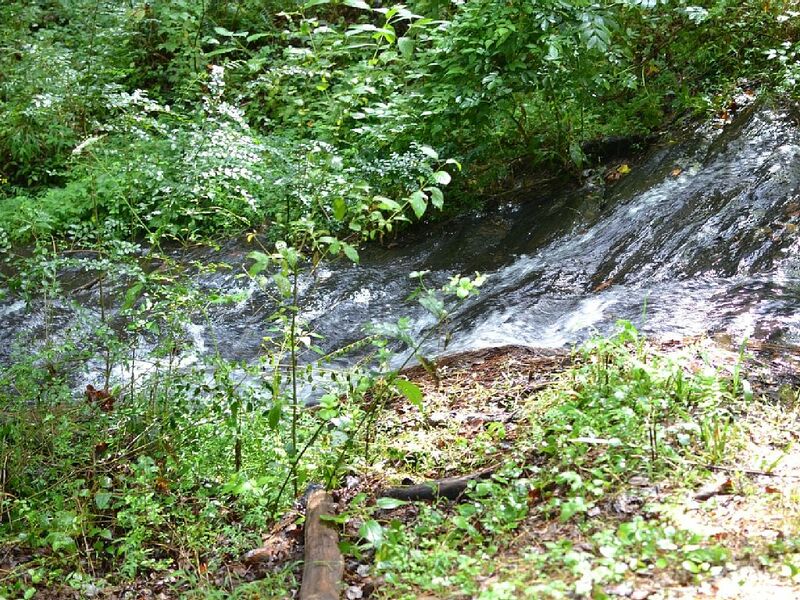 The waterfall can be heard throughout the home which makes for a magical serene atmosphere! The owners have recently added fire pit at the waters edge if you like t...o roast marshmallows, tell stories or just enjoy a camp fire environment. 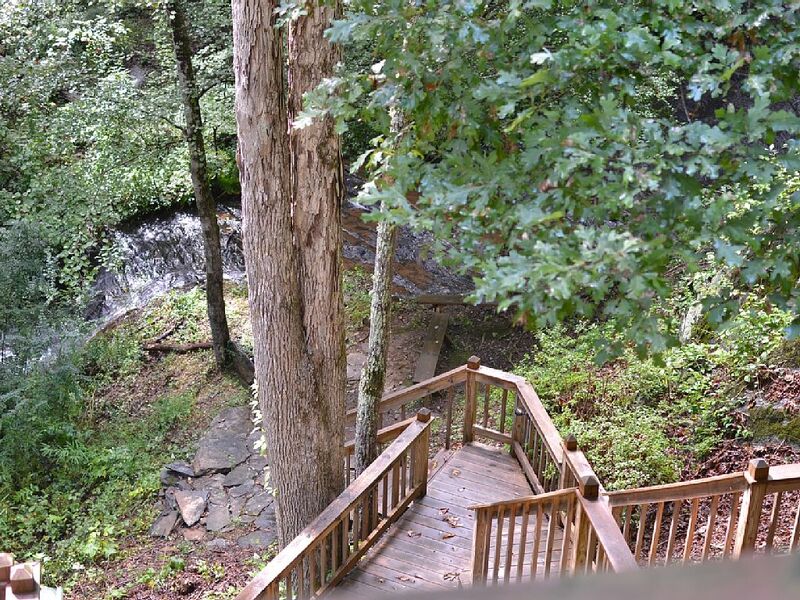 There are steps that lead down to the river which makes for an easy and short walk to take it all in. Take the kids to the end of the road and use the community dock to fish the river. This is a federal river and stocked! Take the camera! This home sleeps up to 8 and still leaves enough room for everyone there to have their own space. 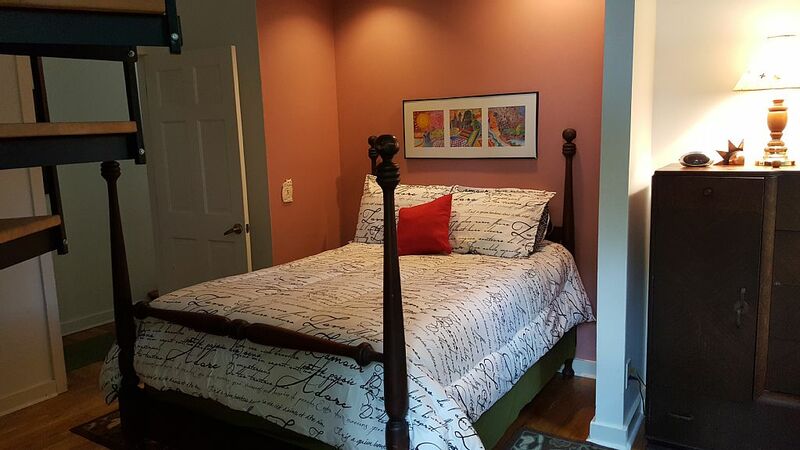 The master bedroom is located upstairs with an amazing king bed. 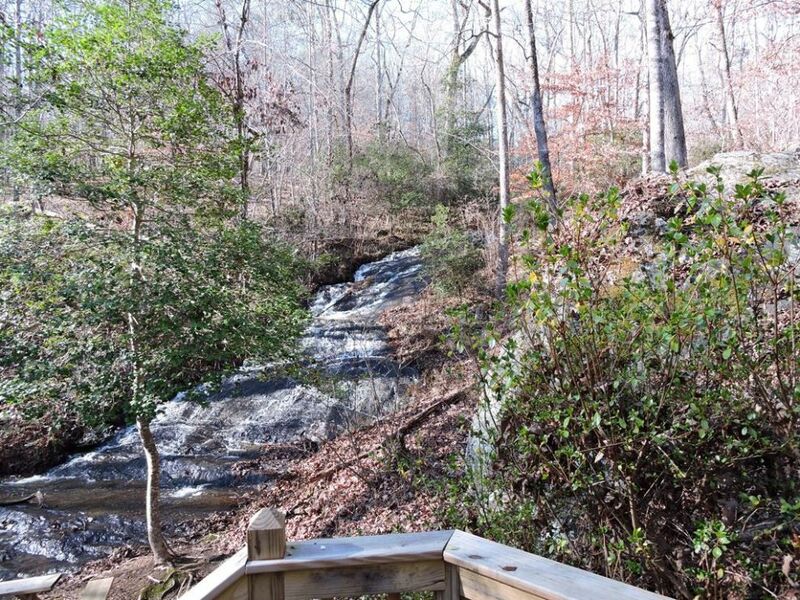 In the master bedroom you have corner windows that have views of the waterfall, and back yard that you will find is so relaxing and not to mention how peaceful it is to be able to sit out on the deck and loose yourself in the wooded views. 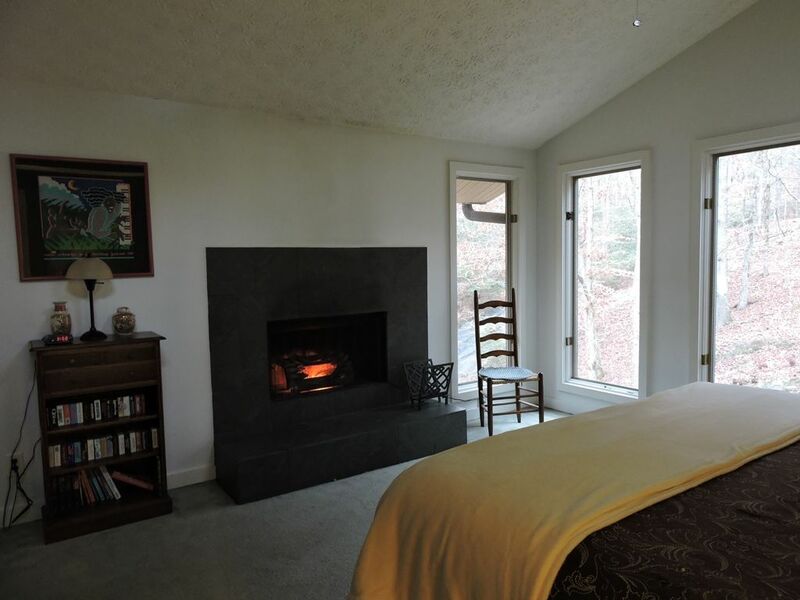 This bedroom has a fireplace that once you light it and open your windows for the views you will never want to leave the room. 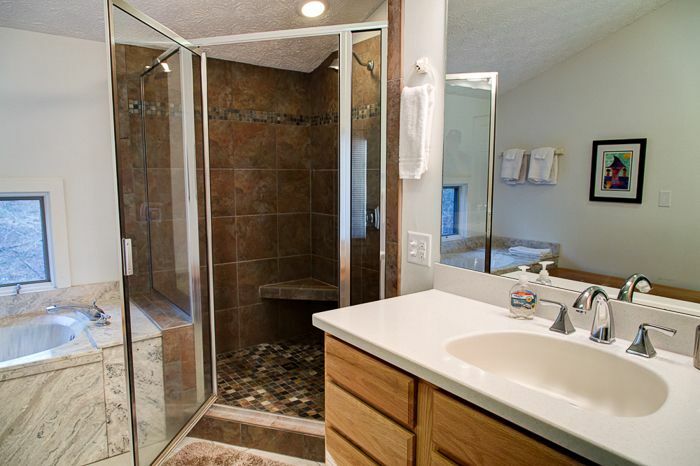 The master bathroom has a private bath with Jacuzzi tub and large walk in shower. 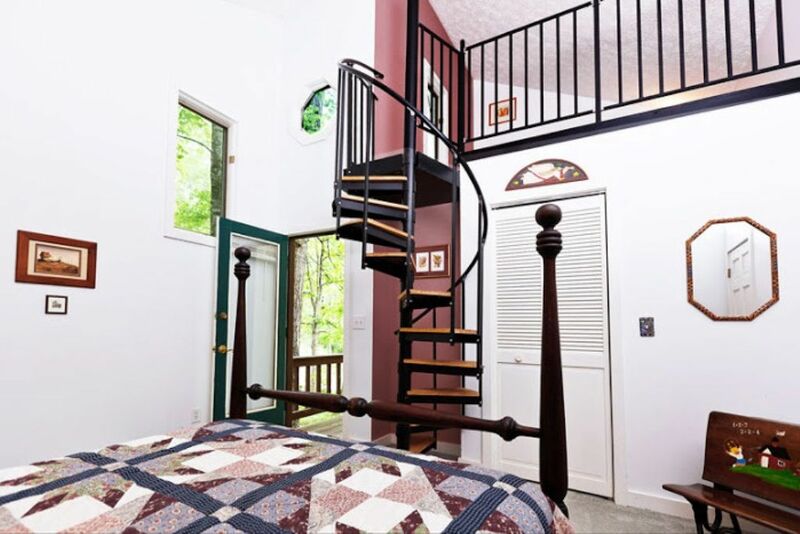 The second bedroom is on the main level with a full size bed and cute spiral stairway like in the movies that lead to loft area in the same suite. 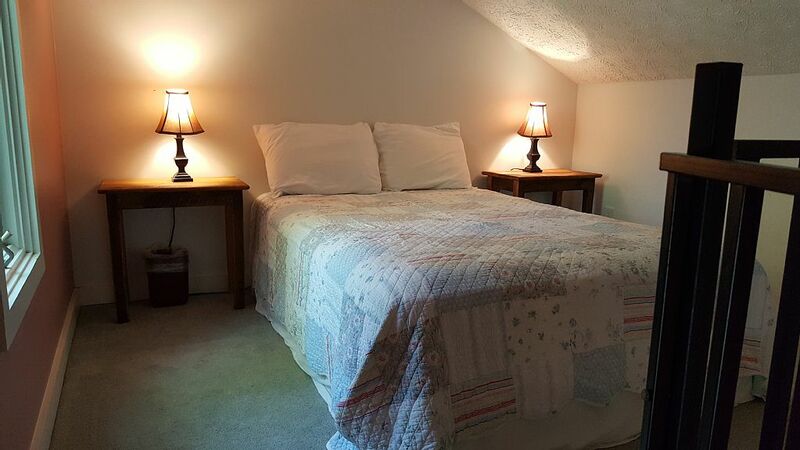 The loft has a full size bed up their that is perfect for young children. 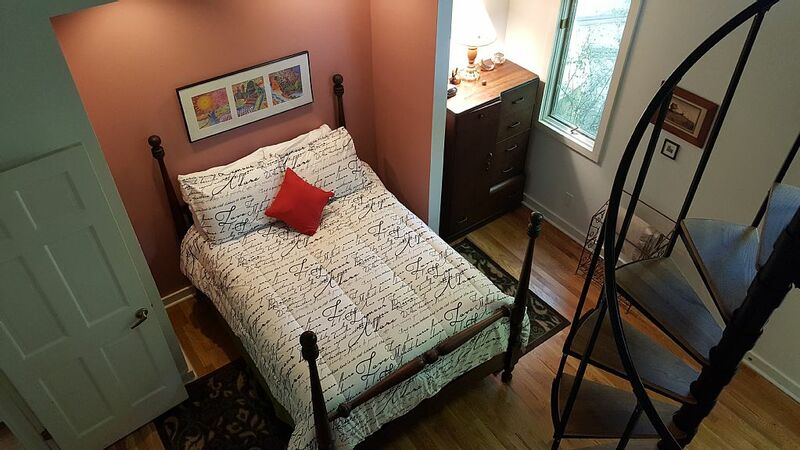 The third bedroom has a queen bed and with a private door to their balcony. 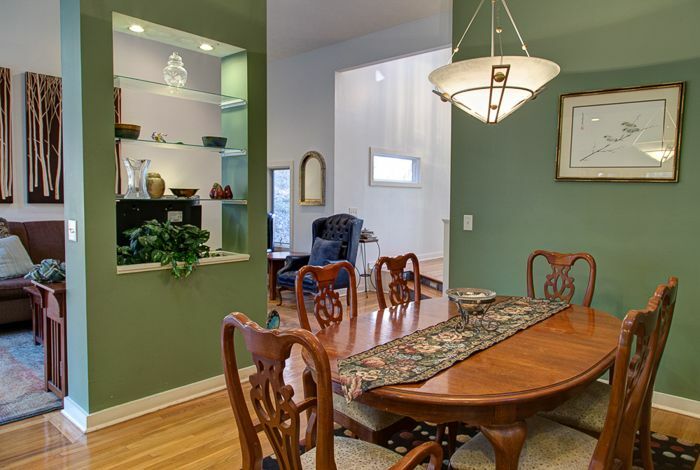 You will have a nice large dining table in the dining area if you are looking to have a sit down dinner for the family. The kitchen is fully stocked for anything you will need to cook with. 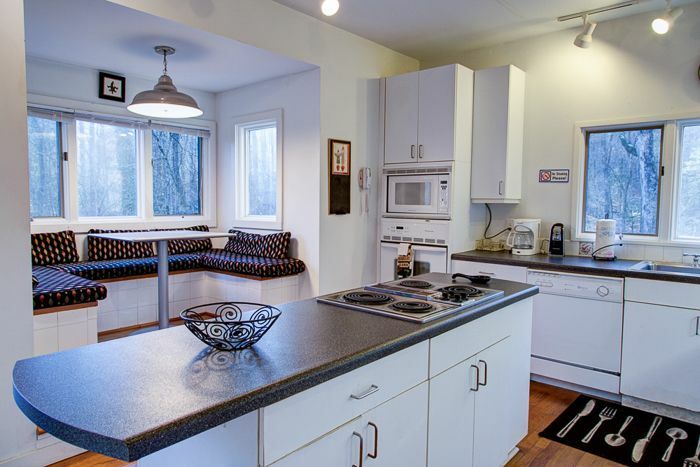 You cannot miss the adorable built in seating area that seats up to 4-6 people. 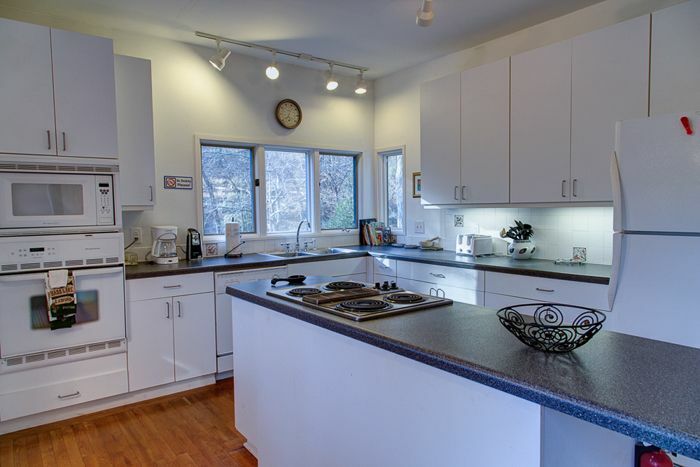 There are also views of the waterfalls and back yard from not only the kitchen door that leads to the patio but around the raised kitchen table. 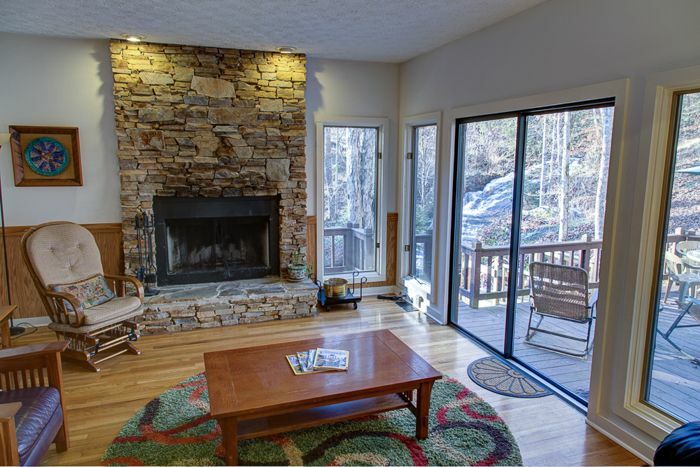 Falling waters is a fantastic home if you are looking for a getaway and we promise you will never want to go home!!! Home and deck over looking water fall was fantastic! Enjoyed tremendously! The setting is beautiful, the house interior architecturally interesting and attractively decorated. 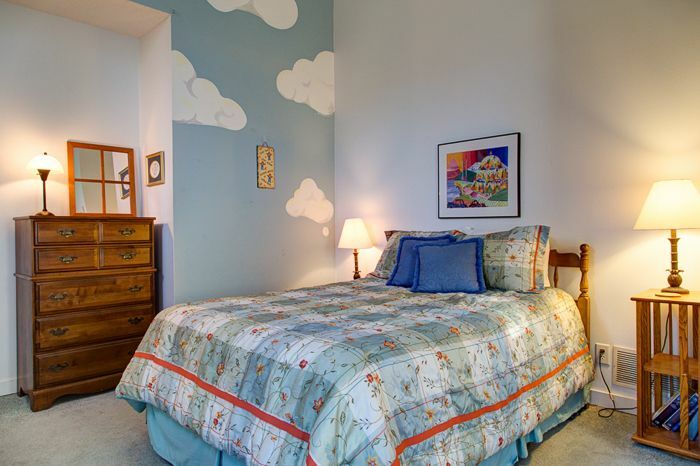 HOWEVER, I do not recommend this place for families with young children or with older adults. I am referring solely to safety issues inside the house. There is a large open balcony on the second story, from which an unguarded child might fall. When I read in the description there are many steps, I thought, "Oh, I climb steps all the time." But these are not necessarily flights of steps. Because rooms are on different levels, there are four places where a person must go up or down two steps (one place on the deck, not visible in the dark). These are not in expected places and can take a person by surprise. We were relieved to come away without anyone falling. Also, there is no banister on the flight of stairs leading up to the master suite. 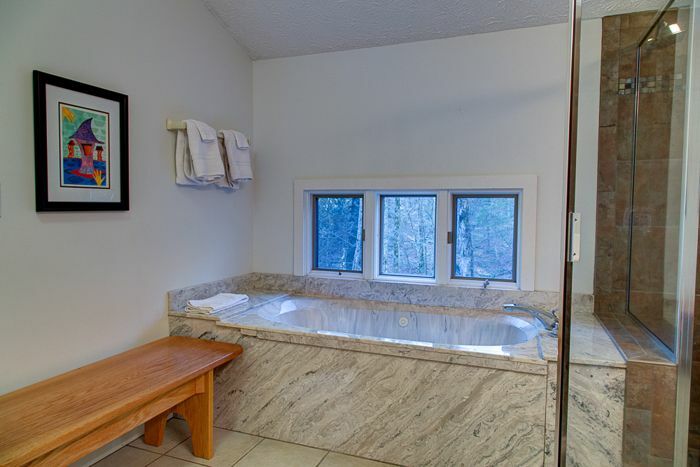 Bathrooms: a grand one for the upstairs master suite, but only a small one for the three downstairs rooms to share. (We had two teenagers--need I say more?) Outside lighting on the deck was misdirected and inadequate. We did appreciate the flexibility the agency allowed in checking out, as no renters followed us. However, potential renters should note that the check-in time is 4:00 p.m. and the check-out time is 10:00 a.m. For a week-end this basically allows one day for what I don't consider a cheap rate. If clean-up time is the issue, I suggest the agency hire more people. All of that negativity expressed, we did enjoy sitting on the deck and making s'mores in the fire pit down the hill. 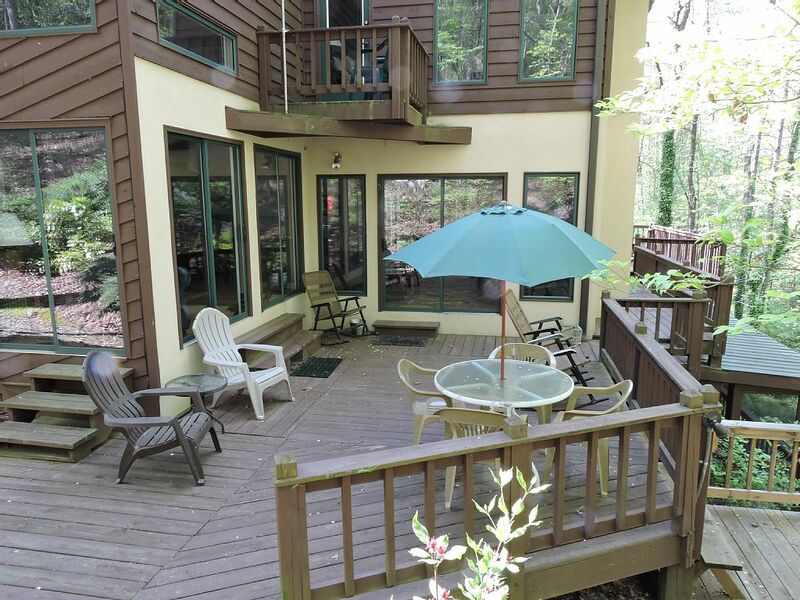 We were a group of 8, 4 kids age (8 to 18) and we all love and enjoyed this property from the inside to the outside. The waterfall on the back and the water sound is so relaxing. The kids love playing and splashing the water while the adults were seating and drinking wine just enjoying that amazing view and water sound, just that " priceless". The property had everything we need it to cook, laundry, etc. Walmart is just 8 min away on on that same street a lot of other stores. 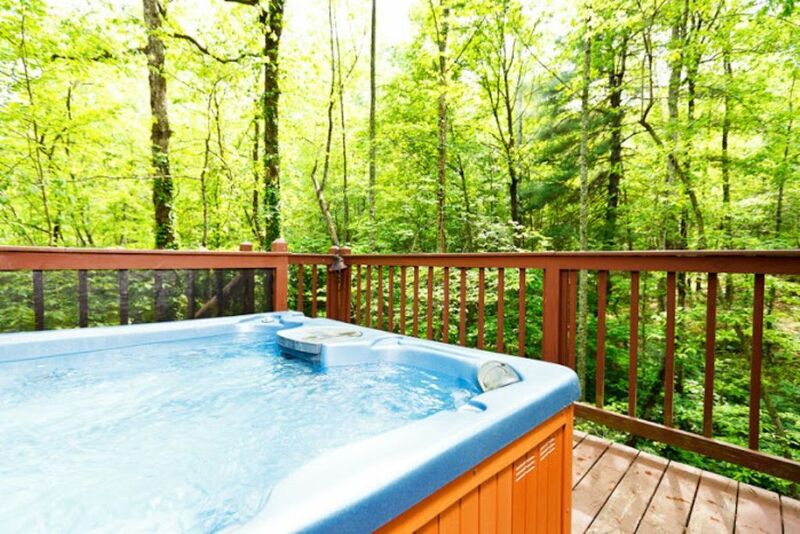 We also enjoy the hot tub 4 times after coming back from Helen Town and falls we would relax in the hot tub, we also did s'mores next to the fall one afternoon the kids and adults enjoy this so much. The property is close to Helen town were there are a lot of things to do, we did the Ziplining, Big Adventure and tubing in Helen (kids had a blast) there is a restaurant in Helen call Bigg Daddy best Pizza I had, we did a wine tasting at Habersham Winery ($7.50) per person 5 different wine they have amazing wines there and at the end you keep the cup, you can also pay 15 and they take you in a tour around the winery highly recommend this place if you like wine. 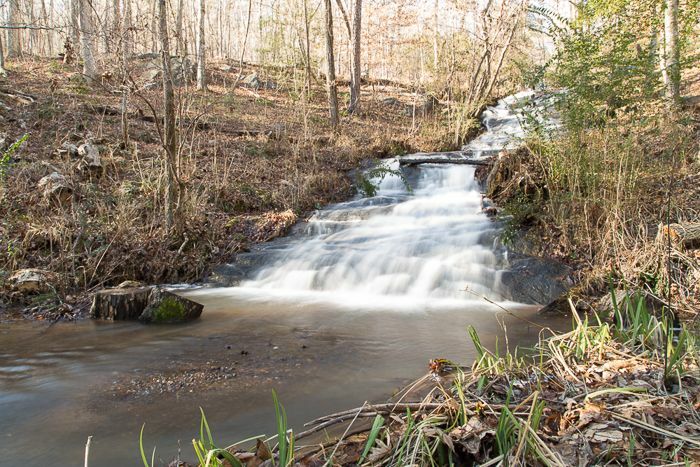 We enjoy Anna's Ruby fall and Dukes Creek falls really beautiful both. 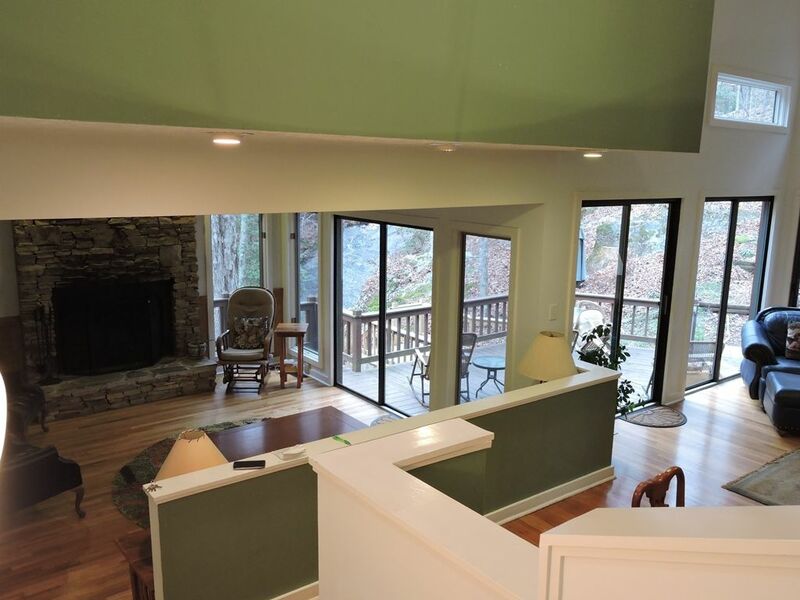 Bottom line it was a great vacation property is amazing and price is even better. Our only downfall was the wifi did not work upon arrival. We are a tech family so that is super important to us and always a criteria for where we book. Especially in an area with spotty cell reception. 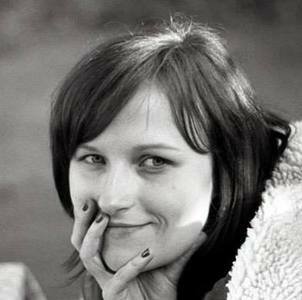 It was a reunion trip with our three grown children and I would have loved to show them options of things to do online the first night. After multiple phone calls, text messages and an on site visit by the provider on the second day the WiFi was restored. It would have been upsetting in a four bedroom home with only one bedroom having a television to not have Netflix on our tablets. We tend to watch evening television to unwind after all the activities of the day. The kitchen could do with a set of pots and pans for cooking. There was one scratched fry pan, one small eight inch fry pan, and a 5 quart pot. No saucepans of any type. There also was only one key between 6 adults and 2 cars which I mentioned before the agent came out to meet and unlock the owners quarters for the service technician (which based on the description I had no idea existed and made it awkward to use the screened porch area) but no additional keys were given. Since it was a reunion for us we stayed together the entire week but I am not sure how we would have worked it otherwise. The size and price worked well for our family so I am still happy with my stay. Our family of 6 stayed for 4 nights at Falling Waters. 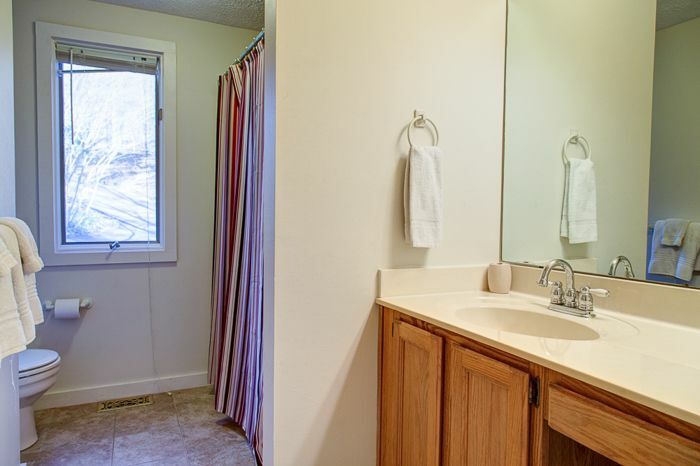 The pros of this cabin: plenty of room for everyone to spread out, nice master bath, plenty of privacy out back, beautiful creek, good kitchen, convenient to lots of places. Cons: very dated in its furnishings, needs new carpet and paint, very close to the road and there was road work while we were there, wifi never worked. Patty was very friendly and our kids had a great time! Beautiful Mountain Home With Lake & Mountain Views. What brings you to Clarkesville? Who's joining you?